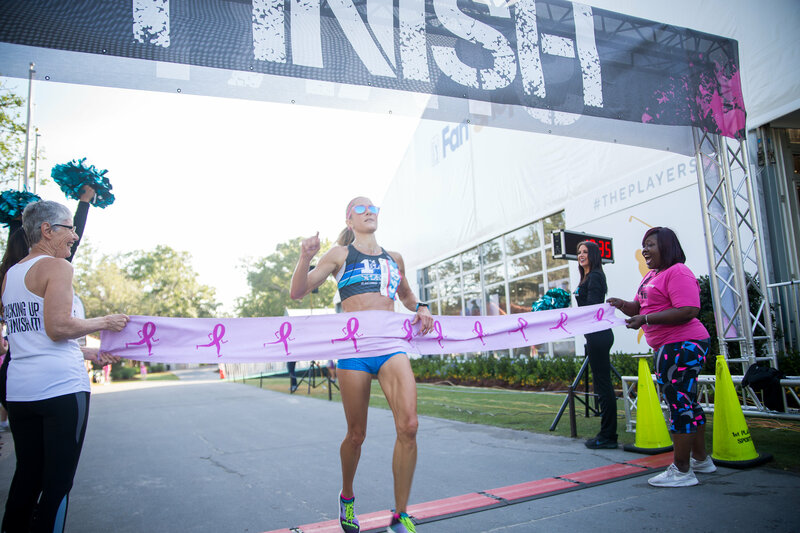 Awards are given to top breast cancer survivors, top overall finishers and age group winners. Age group awards are awarded to the top three in each of the following male and female age groups: 10 & under, 11-13, 14-19, 20-24, 25-29, 30-34, 35-39, 40-44, 45-49, 50-54, 55-59, 60-64, 65-69, 70-74, 75-79 & 80 and over. Overall breast cancer survivor, overall female, and overall male winners each go home with a pair of Weekly Greenside Lounge Passes to THE PLAYERS. Our overall breast cancer survivor, overall female male winners, and top fundraiser each go home with a pair of Weekly Greenside Lounge Passes to THE PLAYERS. The Greenside Lounge is a social hospitality venue located next to the #9 Green offering fans an upgraded tournament experience such as an interior climate controlled bar area, open seating, and TV viewing in close proximity to #9 Green, back practice area, practice range, Clubhouse and #18 Green. Oh, and private restrooms. SWEET! All DONNA events are timed by DONNA partner 1st Place Sports. The event will be timed using Race Result Bib Tags. Congratulations finishers! Official results are available through our race timing partner 1st Place Sports.